This worksheet can be used like a test on dates. Very simple and editable. 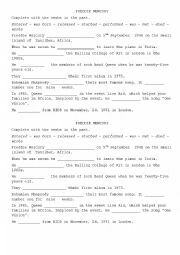 A short biography on Freddie Mercury´s life and some multiple-choice comprehension exercises. 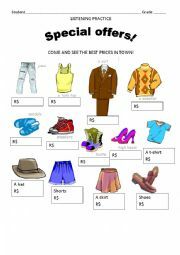 It is a listening activity where the teacher should tell some prices for each clothing piece and students write them. It is good to review numbers and prices. A simple worksheet to review some superstitions. Good to review vocabulary on superstitions. 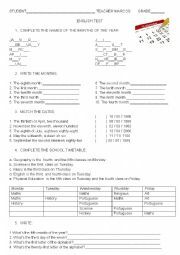 A simple worksheet with some grammar exercises on life events vocabulary. 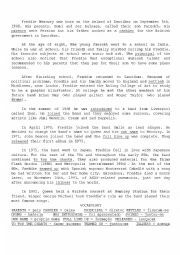 This activity has information about Freddie Mercury´s life. An easy worksheet to review food vocabulary. Countries - Where are you from? 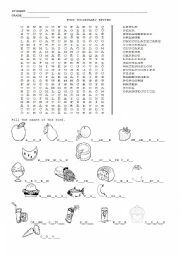 A worksheet to students practice the name of some countries. First write the names, then answer the question "where are you from?" and at last find the countries in a map. I took some pics from another ws, but it´s not the same. There are some texts that students read and identify each person, fill some ID cards with information from the texts and finally Ss write a little text about themselves. 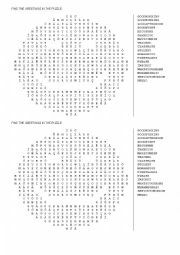 A simple wordsearch to review greetings. Vocabulary practice about actions on environment. Good to work with Should / Shouldn´t. A presentation about Confederations Cup 2013 that will be held in Brazil, in June. It is good for students to know the teams, their flags and place in the world. A presentation about Martin Luther King´s life, with simple sentences using the past simple. A PPT file to practise vocabulary of Halloween. A short biography about the singer Alicia Keys. It can be used before a song. This ppt file is a reading practice for beginners. It focuses on countries vocabulary, to be interrogative and short answers. A simple reading activity to practice to be interrogative and short answers. It´s a reading practice about The Addams Family. Students will practice genitive cese, To be, personal pronouns and family vocabulary.